The KAA Art department will prepare you for future success, whether this be academic, economic or in your personal and social lives. You will have a deep understand of how to become an artist. Our students will feel prepared to enjoy challenging real life situations, and be able to meet them calmly, creativity and confidently. In the Art department we are proud to be able to offer you a broad curriculum with a strong emphasis placed upon contemporary art. You will be given the opportunity to study Fine Art, 3D, Photography and Printing. It will be challenging, inspiring, and will enable everyone to achieve their full potential and much more. We believe learning is a collaborative process, and that we all learn best when we learn together; teachers included! Students will learn and understand how to record, explore, refine and present. Students will build on existing skills to support their learning towards GCSE and A level, and prepare for real life situations. At KAA we believe every student will be proud to always be creative, to keep questioning long after the lesson has taken place and gain a passion for the Arts. 7 Autumn How much colour can a page hold? 7 Spring Can you make something out of nothing? 7 Summer Can a scribble be a work of Art? 8 Autumn What can you see in your reflection? 8 Spring Does a bowl have to hold water? 8 Summer What can you build with a line? 9 Autumn Is sewing women's work? 9 Spring Is a picture really worth a thousand words? 9 Summer Can art really speak to you? Formal assessments are structured throughout the year in an assessment cycle. The year comprises six assessment cycles for Art. KAA students will have structured half terms consisting of teaching weeks, followed by consolidation (revision) week, assessment week and review week. This structures will allow the department teachers to accurately ensure the understanding of each student, provide detailed feedback and subsequent interviews or support. It will also ensure parents are kept informed of their child’s progress at all times. This cycle will prepare KAA students for rigorous examinations in the future at GCSE, A Level and beyond. Students will sit a 55 minute practical assessment during assessment week, to create a realisation (final piece) on a chosen theme (the fertile question). This final piece will demonstrate the skills and knowledge they have gained over the half term. Ongoing formative assessment in Art will develop KAA students’ abilities to take control of their own learning. During every stage of the assessment cycle we ask students to reflect upon their own understanding and revise independently. The vision is for KAA students to make progress from year 7 towards a level 9 at GCSE by linking small topics to the bigger picture. The following is taken from the KS3 and KS4 scheme of work showing what a KAA student needs to learn, understand and develop each year in Art. Students will produce one thirty minute homework per week. During the Autumn term students will be issued with an A4 sketchbook, students must complete their homework in this sketchbook unless otherwise instructed. Remember homework is your time to show off all the skills and knowledge that you now know. It gives your Art teacher a chance to ensure you have understood the topic currently being studied, and also gives you an opportunity to get feedback on work that you have completed independently. Homework is always uploaded to the Art section of KAA Online. • Be careful when using felt tip pens, ensure you use them carefully and sensitively. Avoid highlighter pens, colouring pencils are generally far more effective. Students play a key role in contributing to the school environment, and many classroom displays around the academy are designed and produced by a students in a variety of creative ways. There are a number of art clubs offered each term during enrichment from 3.30pm-4.30pm. For more details see our Enrichment page. A variety of trips are arranged throughout the academic year to ensure students are able to access the many resources available to them in London. 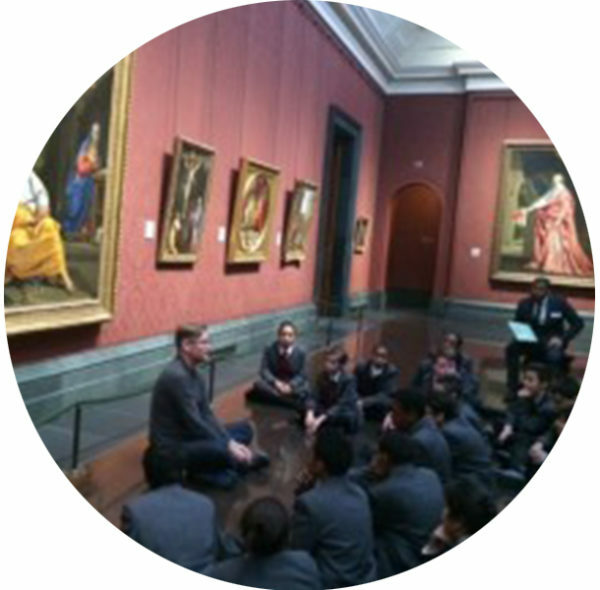 Trips encourage students to build their confidence in a wider range of environments, and support the key Art concepts. House competitions involving all students are often heavily involving the creative arts, and the department strongly supports these events and tasks. The Art Book (ISBN: 978-0714836256) is an extremely useful reference book that contains thousands of examples of art work. Students can borrow this book from the library or find it to purchase online.